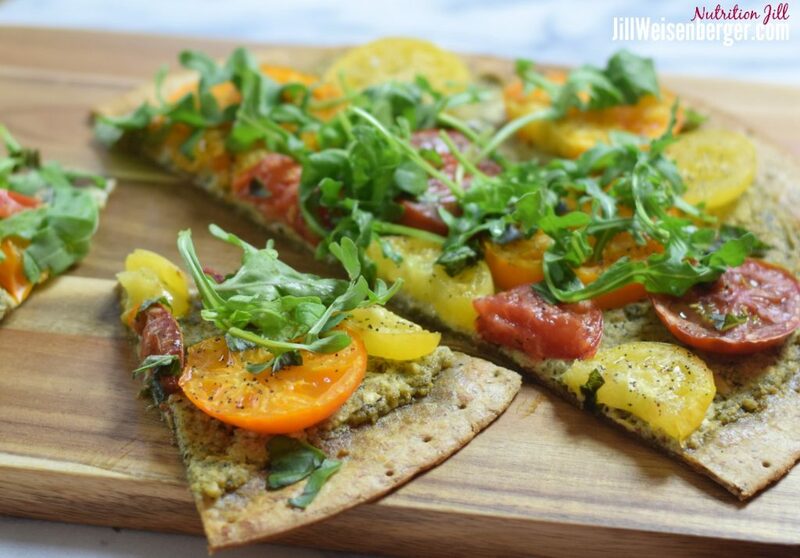 Beautiful heirloom tomatoes inspired this delicious flatbread. And tomato flatbread is so simple to make, yet fancy to serve. I look forward to picking up my farm share each week. We belong to a community supported agriculture (CSA) and thoroughly enjoy it. I never know what will be in the bag with my name on it, so it’s like getting a present of beautiful farm produce. Every week, I get to create something new with that present. 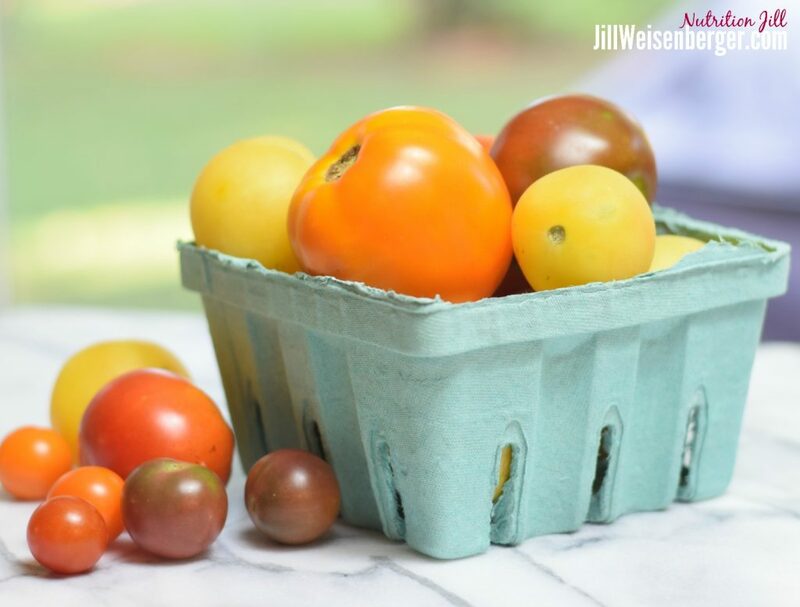 These gorgeous heirloom tomatoes inspired me to create a simple, delicious summer tomato flatbread. Feel free to use whatever type of crust you prefer. I chose a ready-made whole grain crust for ease and a boost of nutrition. I like a thin crust to keep the calories down and to allow the toppings to become the shining star. The walnuts and goat cheese give a tasty unique flavor to the pesto. I think you’ll like it. Walnuts also add some omega-3 fatty acids and might even give a health boost to your gut bacteria. I’ve served this an appetizer and enjoyed leftovers for lunch. The goat cheese and walnut pesto pair perfectly with these beautiful heirloom tomatoes. Save ¼ cup of the goat cheese-walnut pesto to spread on crackers or celery sticks. It's delicious! Using a food processor or powerful blender, process the first 6 ingredients (basil through salt) until well mixed. Add the goat cheese and process until the goat cheese it thoroughly incorporated. Set aside. Slice the tomatoes to about ¼-inch thickness. Place them single layer onto a double thickness of paper towels. Sprinkle with ¼ teaspoon salt and cover with another double thickness of paper towels. Line a baking sheet with parchment paper, and place the pizza crust on top. Spread ¾ cup of the goat cheese and walnut pesto onto the pizza crust, leaving about ½-inch margin along the edge. Refrigerate the remaining ¼ cup pesto for another use. Gently pat the top of the sliced tomatoes to remove excess moisture. Place the tomatoes over the pesto. Sprinkle with black pepper. Bake for 8 minutes or until the tomatoes are soft and the crust is cooked through. Remove from the oven. Sprinkle with chopped basil and fresh arugula. Slice and serve. 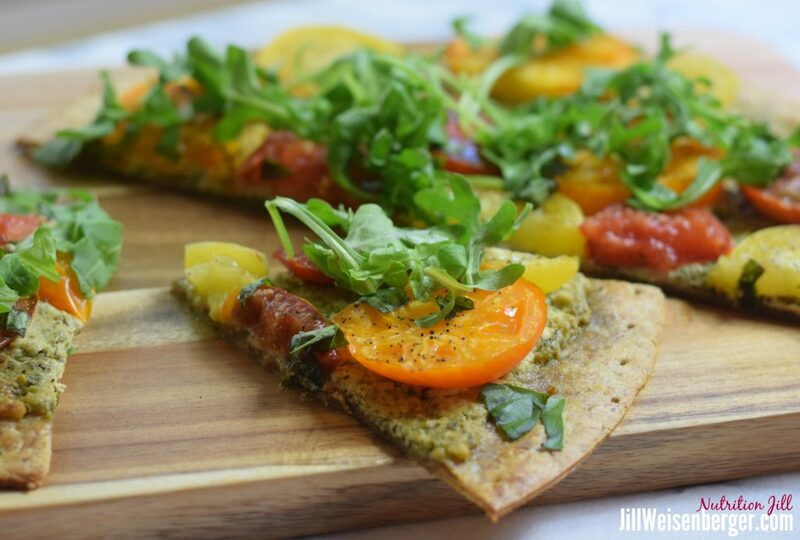 There are so many wonderful ways to enjoy summer produce, including this delicious heirloom tomato flatbread recipe!